Funding Hospice Care: Donations make a difference! As an entity of Lincoln Health System, Lincoln Medical Home Health and Hospice is a nonprofit home health and hospice provider. Although we share one name, we are two distinct agencies, providing both Home Health and Hospice services to the residents of Lincoln County and surrounding areas. As a hospice, we are reimbursed for care provided to the terminally ill by Medicare, Medicaid, or private insurance. Hospices are paid on a per diem basis, which means that reimbursement is a set fee based on how many days the patient is enrolled in the program and the level of care provided. In return for payment, Medicare, Medicaid and private insurance companies expect a hospice to provide all services that the patient and family need that are related to the terminal illness. So, regardless of the number of clinical visits that are needed, the amount and kinds of medications provided, or the supplies and equipment that a hospice patient requires, insurance providers pay one flat daily fee. The total cost of care for some patients will be slightly less than what is paid, but the cost of care for other patients will greatly exceed what the agency will be paid by insurance providers. Hospice strives to make sure that each patient and his or her family’s individual needs are met, regardless of the expense. Hospice services are also provided to those persons within our jurisdiction who do not have any insurance coverage and cannot afford to pay for care. This is a great service to our community, but the costs can be extremely high. Additionally, the Hospice benefit includes bereavement and grief support for the patients’ caregivers. For a full year after a patient’s death, the family and caregivers are offered bereavement support. This service is not billable for the hospice and is provided free of charge to all patient families. It is a wonderful extension of the hospice program, but it does cost the hospice money to provide it. The cost of hospice care is partially offset by the use of trained volunteers who can assist with caregiver relief, bereavement visits and mailings, and office tasks. We are fortunate to have a wonderful group of volunteers. Careful management of medications, supplies, and man-hours is also a must. But, even with careful resource management, expenses are incurred that must be absorbed by hospice. For this reason, fundraising efforts and donations to a hospice can provide invaluable financial support. Lincoln Hospice has not done a lot of fundraising over the years, but has been very fortunate to receive generous donations from local civic organizations, the Lincoln Health System Foundation and Lincoln Medical Center Auxiliary who have held fundraisers to raise money that is donated to our hospice to support our work. We receive random individual donations in the mail that are welcome surprises. Occasionally a family will ask for donations to hospice in lieu of flowers when a loved one who has been in our care passes away, and those are very special gifts that allow us to provide care to all who need it. Another valuable source of assistance for our hospice program is Hospice of the Highland Rim Foundation (HHR Foundation). This non-profit charitable organization assists hospice patients in multiple counties who are suffering end-of-life hardship due to their illness. In assessing the needs of a hospice patient and family, our social worker may find that they are financially struggling, and perhaps unable to pay a utility bill or other expense. They may need a food voucher to offset grocery costs. The HHR Foundation can assist these families with such needs during some of the most difficult times of their lives. In 2016 alone Hospice of the Highland Rim Foundation provided more than $14,000 in assistance to Lincoln Hospice patients and families. That kind of generous support and collaboration ensures that our patients will continue to have their needs met. Last year, Lincoln Hospice held a Butterfly Release as both a memorial to our patients and as a community event to raise awareness of Hospice and the invaluable services we can provide. The event was truly a celebration of life and very well received. 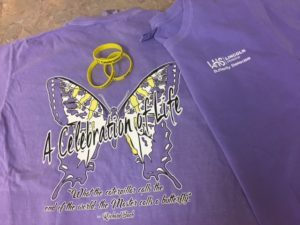 This year, the 2nd Annual Lincoln Hospice Celebration of Life Butterfly Release will be held on Sunday, June 4, 2016 at 2pm at Stone Bridge Park. This year, the event will be a fundraiser. All family members currently in the hospice bereavement program are formally invited, but the event is open to the public, and attendance is free. Individuals or groups can purchase butterflies in memory of a loved one who has died, whether that person was a hospice patient or not. During a short program of celebration, the butterflies will be released. Music will be provided by Josh Ogle and his family and refreshments will be served. T shirts may be ordered prior to the event and bracelets will be for sale at the event. All proceeds will benefit the patients and families of our Hospice program. The Lincoln Health System Facebook page has more details about the Butterfly Release Event or you can visit our website here. For more information about Hospice of the Highland Rim Foundation, and how you can support their efforts, visit their website. They hold several events all year long, and can always use assistance.